NES Yume Penguin Monogatari (JPN) in 09:49.0 by Yunshui & x2poet. 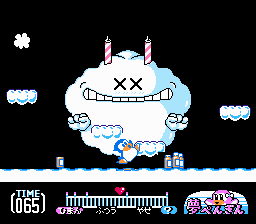 Yume Penguin Monogatari (夢ペンギン物語) is a hybrid platform/shooter video game developed by Konami in 1991. The player takes the role of a penguin named Penta, who is getting dumped by his girlfriend Penko, because he has become far too obese for her liking. The game follows Penta's quest to win back his ex-girlfriend by losing weight via collecting diet drinks and avoiding enemies. This game was only released in Japan.